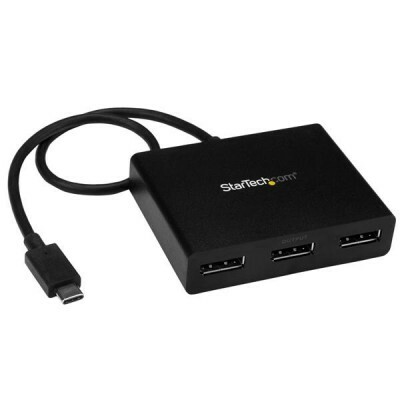 This MST hub lets you connect three DisplayPort monitors to your USB-Câ„¢ computer. MST ensures hassle-free setup by natively working on any WindowsÂ® device that supports DP alt mode over USB Type-Câ„¢, such as models of Dell Precisionâ„¢, Dell XPSâ„¢ laptops and ASUSÂ® ROG GL752. The MST hub also works with Thunderboltâ„¢ 3 ports to provide Thunderbolt 3 to triple DisplayPort conversion. Plus with a lower price point than docks, MST offers a multi-monitor solution thatâ€™s more cost-effective than a traditional laptop docking station. The newest generations of laptops are more portable than ever. Unfortunately, this means youâ€™re left with fewer video outputs and a small integrated screen. This MST hub solves these problems by letting you connect three displays to a single USB-C port on your computer, which makes multitasking much easier.